From the pop up Summary Zoom dialog, click each slide that you would like to start a new section and be added to the Summary Zoom slide. A new “Summary” slide is added to the presentation. 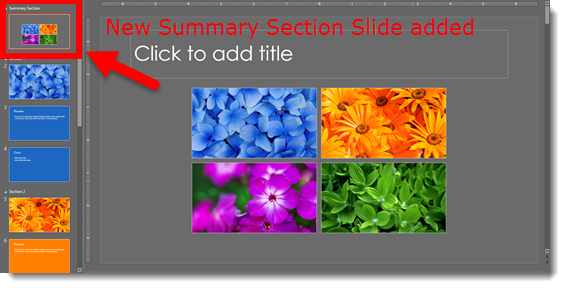 The Summary slide has a grouped set of images that are thumbnails of selected slides and have all programming added to make them presentation navigation elements. 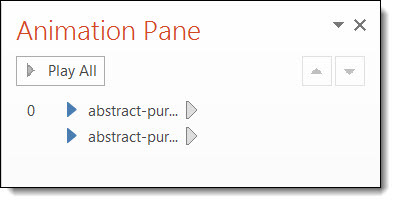 In addition, each slide that was selected in the Summary Zoom dialog is the start of a new section. The thumbnail group has some good, and maybe not-so-good, points. Each thumbnail image is exactly what is on the slide it links to. 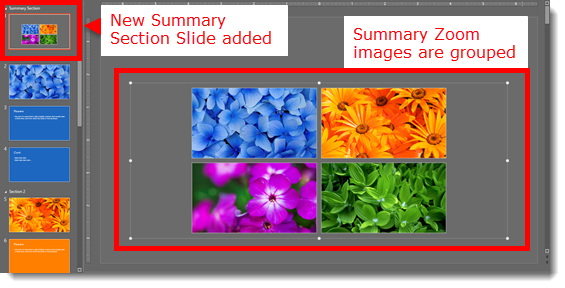 If you update the slide content, the thumbnail automatically updates (dynamic live content)! 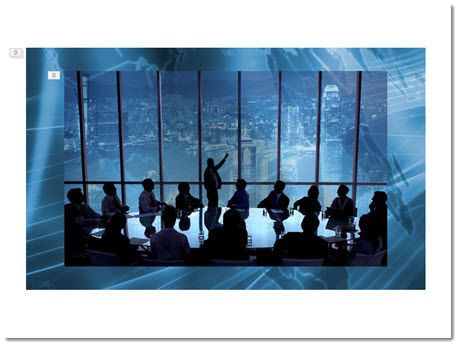 The thumbnail image shows exactly what is seen on the slide, animated content cannot be taken into account. 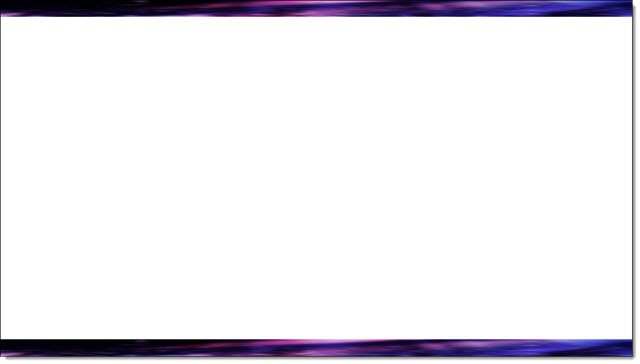 So if the slide starts blank and then content animates on, the thumbnail will show the animated content. Basically, whatever would print is what will be visible on the thumbnail. The images cannot be ungrouped. 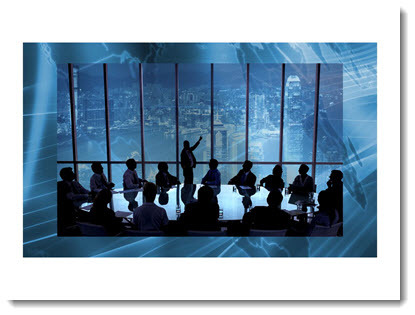 The bounding box for the group is much larger than the thumbnail images. 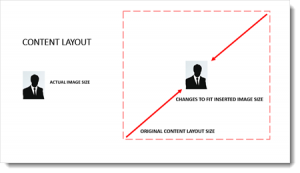 Images can be moved, resized, and to a limited degree, stylized, (eg. drop shadow, bevel, reflection, and rotate all work). But Z-order (front to back) cannot be changed. Rearranging and resizing can be tedious within this locked group element. 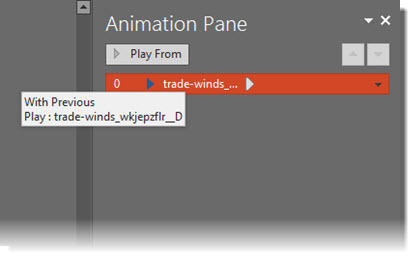 When selected, in edit view, each thumbnail displays a link icon showing it has an active link and where it links to! The arrow (that appears to be indicating backwards or return) means the thumbnail has a link to go somewhere. The numbers show Section number and how many slides are in that section. 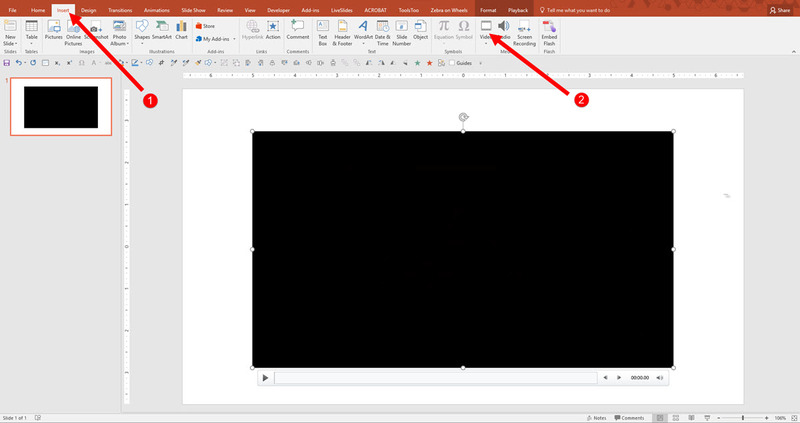 In addition, the link icon visually shows when a thumbnail does not have an active link by removing the thumbnail image and displaying a broken link icon. The Summary Zoom is a great new feature. 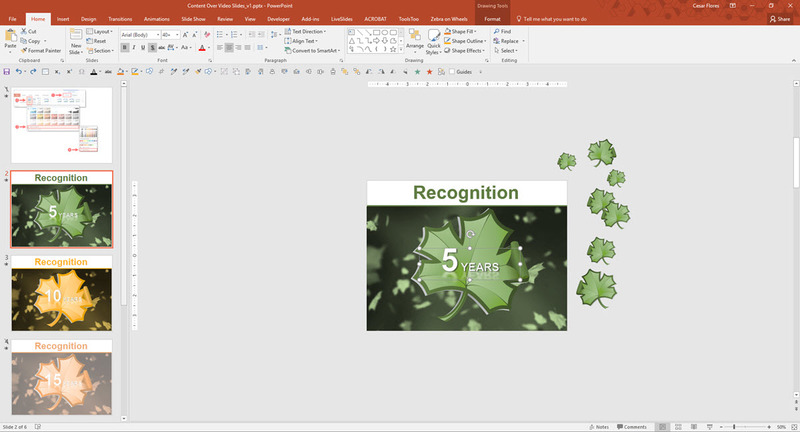 It also introduces some fantastic new tools to PowerPoint (like icon links and dynamic live content updating) that I hope to see expanded into other areas of PowerPoint. 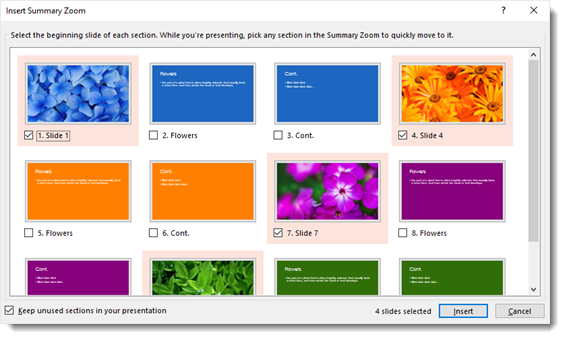 Many thanks to Wanda, a TLC staff designer, for developing and testing the demo slide deck used for Summary Zoom. 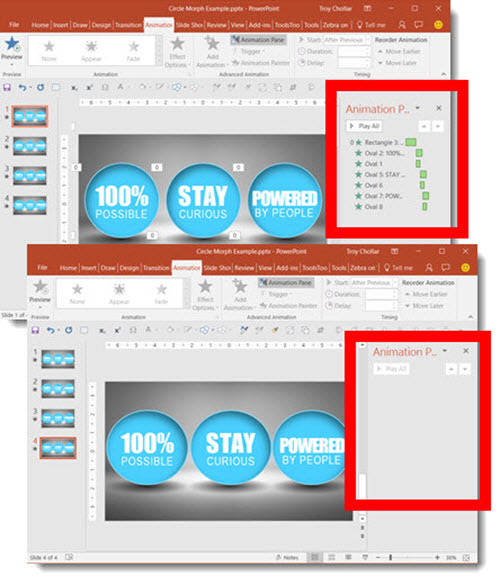 Here is a demo video showing how quickly Summary Zoom and non-linear presenting options can be added to a presentation. Why do shapes sometimes jump further than you want when moving them with the arrow key? 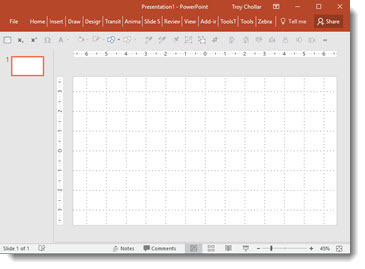 What is the PowerPoint Grid? How are they connected? 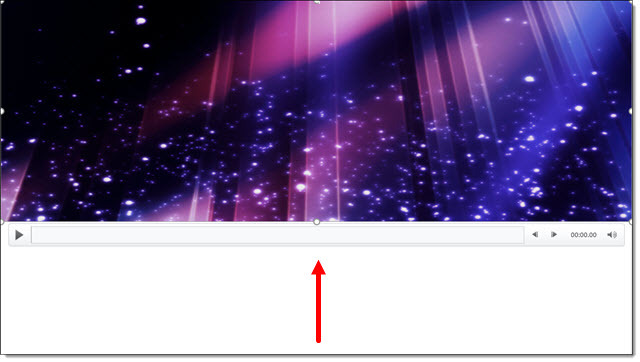 1- DISPLAY GRID ON SCREEN is the same as the above VIEW > SHOW > GRIDLINES. Both turn on/off the gridlines. 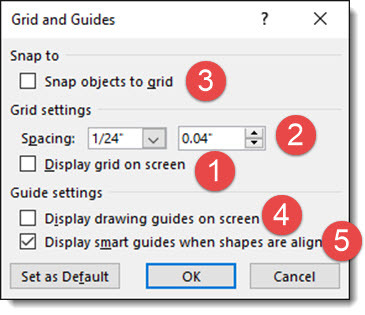 4- DISPLAY DRAWING GUIDES ON SCREEN can also be accessed a few ways, including as a button on my custom QAT (Note: I use guides in my design process much more than grids). 5- DISPLAY SMART GUIDES WHEN SHAPES ARE ALIGNED is a love-it or hate-it feature (I am in between and turn this on/off as the design needs). It is like SNAP TO GRID, but instead objects snap into alignment with other objects. Back to our original question, why do objects “jump” further than you want when moving with a mouse? 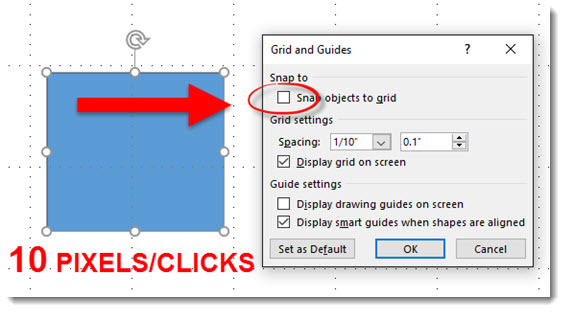 The answer is NUDGING, or moving an object with the arrow key, is directly connected to SNAP OBJECTS TO GRID. If my goal is to move the blue box to the right and touch the next grid line, the number of arrow nudges is going to depend on whether the Snap to Grid is on or off. – With Snap to Grid turned off, I have complete control moving an object, each arrow nudge is 1 pixel. 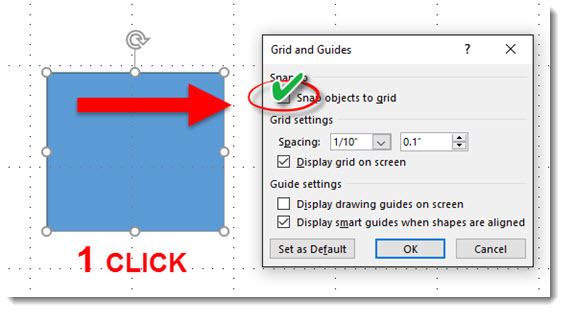 In this example, I would need to arrow/nudge 10 times to move the blue box to touch the next grid line (the blue box is 10 pixels away from the grid line). – With Snap to Grid turned on, I have less control moving an object, each arrow nudge jumps to the next grid point. In this example, the next grid point is the next grid line, so 1 arrow/nudge jumps the blue box to touch the next grid line, which may be good or bad (or frustrating). 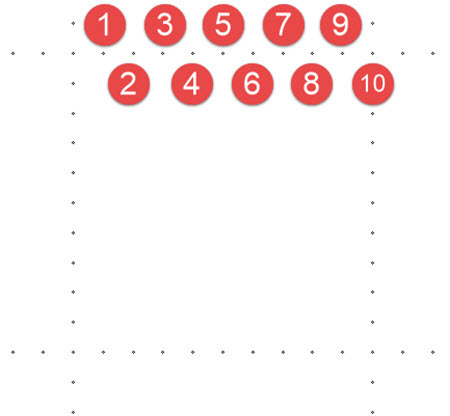 Here is a close up of the grid points. 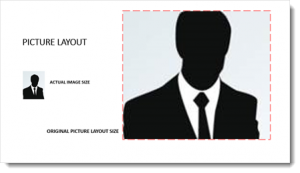 With this 1/10″ grid, there are 10 points in any direction, and an object will nudge at the most 10 clicks to move across the grid (but the grid in this example is actually 300 pixels wide/tall). 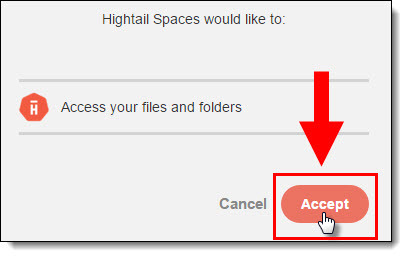 Hightail, formally YouSendit, has introduced a new tool, Hightail Spaces. So in addition to the file sharing services, they have added an online tool for video and image feedback. 1. Log in (or sign up) to your account, and click on the Spaces tab. 2. If it is your first time accessing, click Get Started, and Accept. 4. All of your Spaces show up, which makes it easy to have separate folders/Spaces for each client or project. 5. 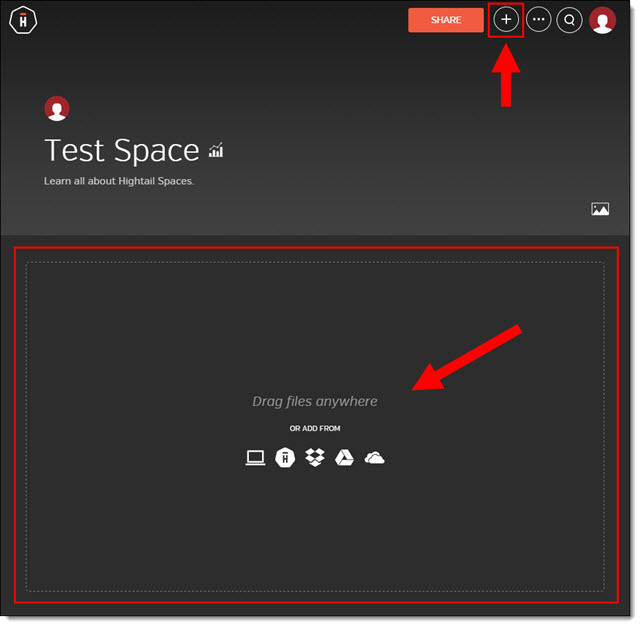 Hover over a Space and click to View any files, get a share link, or delete that Space. 6. 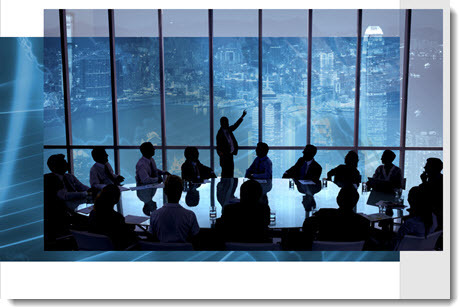 Spaces can be personalized to a project or client with a: (1) custom name and (2) description. The (3) chart icon shows the analytics of that Space. 7. 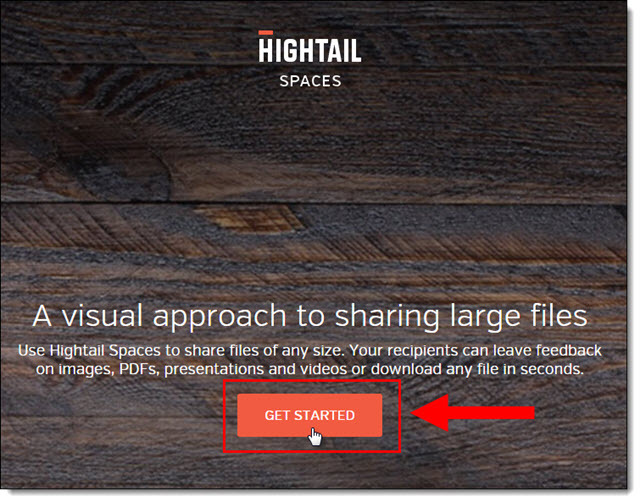 When viewing a space, use the Share button to invite clients to securely view any files in there. 8. 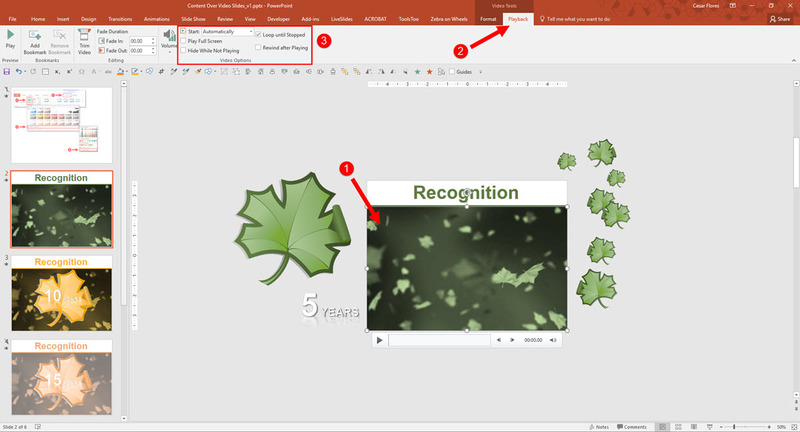 To add a video for review, either Drag and drop or click the plus icon (which also allows files to be uploaded from other services: Dropbox, Google Drive or Microsoft OneDrive). 9. 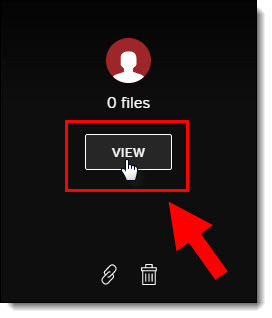 Once uploaded, every file is displayed with a preview thumbnail. 10. To review, your client just clicks on the thumbnail which opens the video preview and the comments side panel. To add a comment, drag a marque directly on the video and type any comment, then click Post. The comment pane lists all of the comments and replies. A really great feature is that the video playback has a red dot for each comment. 10. 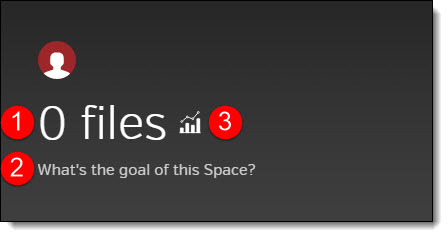 Spaces allows multiple versions. The current version is displayed at the top of the page. Previous versions are viewable by clicking on the version number in the list. 12. 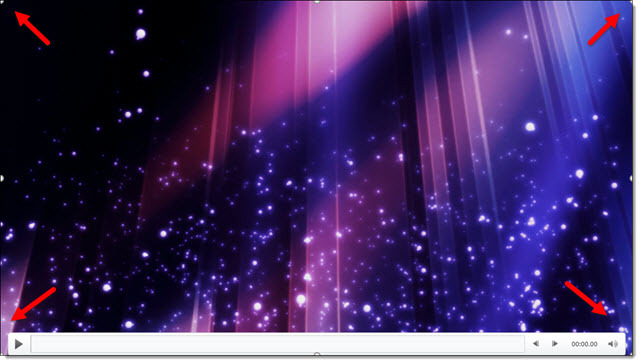 Access and share links are controlled by the overall Space and the individual files. (1) Access can be public or private (2) Copy a link to send in an email, text or IM. 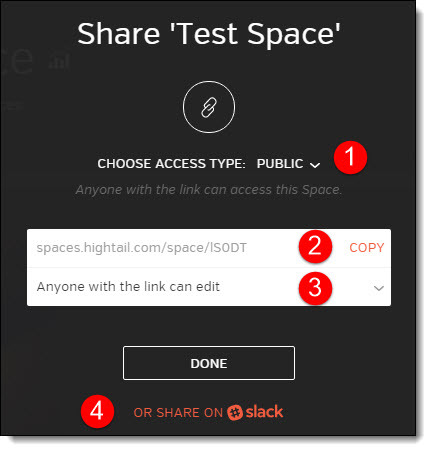 (3) Access options include edit, comment, download, and (4) Share directly on Slack (if you use that). Note: Download options are only available with a paid subscription. 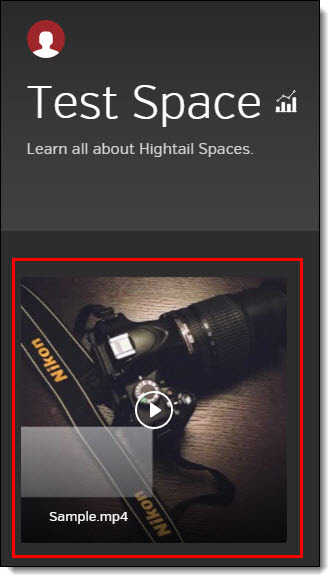 Hightail Spaces is another client review option to check out. There are both free and paid options. 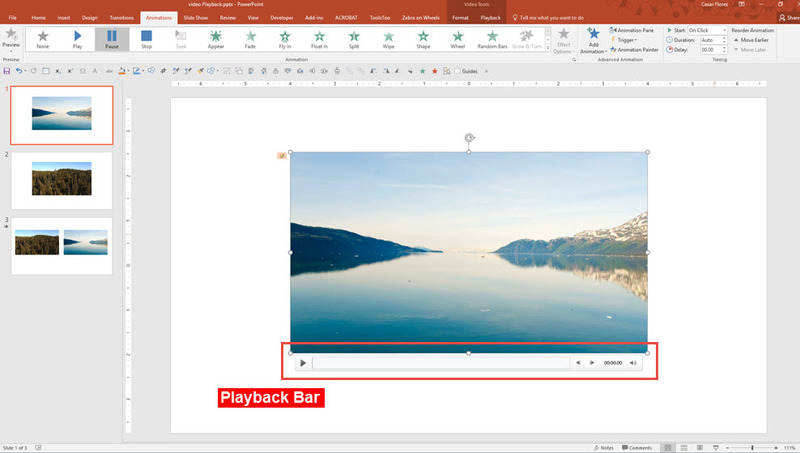 In PowerPoint, you can place content on top of a video background to create a dynamic and dimensional design. 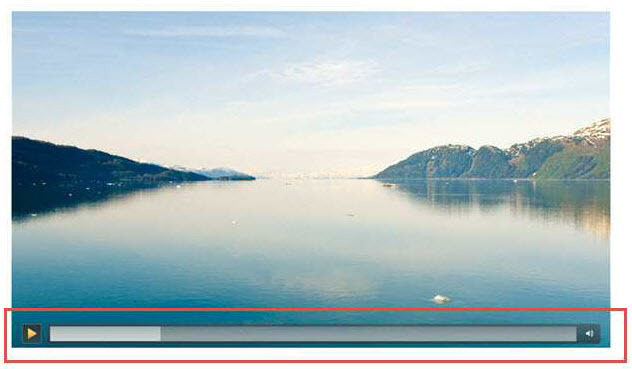 Insert (1) Video onto your Canvas , click (2) Video and select your Video. 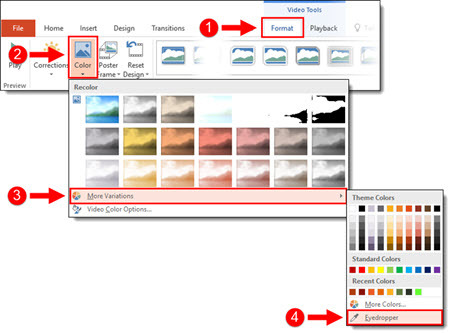 To recolor your video, click on (1) Format Tab, select (2) Color tool in the drop down, you get Recolor options.You can add custom colors by Selecting the (3) More Variations or using the (4) Eyedropper tool. Once you are satisfied with the styling of the video, select your (1) video on the Canvas, select (2) Playback, set the video to (3) Start Automatically and Loop until Stopped. 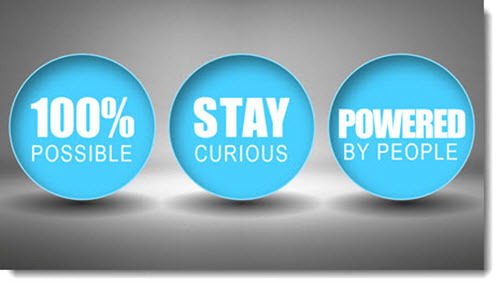 Next, add stylized text and graphics directly on top of the video and animate as desired. 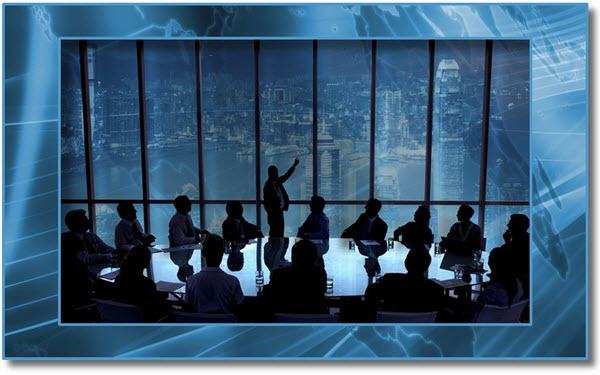 The end result is a slide with content that animates directly on top of the video background.